It's just been just over a month since the release of In Sheep's Clothing and now we've got the finale to The Wolf Among Us to play. This one is called Cry Wolf and we once again have a very short episode on her hands at only 70 minutes of gameplay, only slightly longer than one hour. Note that the review will read very similar to previous The Wolf Among Us reviews as not really much has changed besides the plot. Look out for a final review of all five episodes soon! 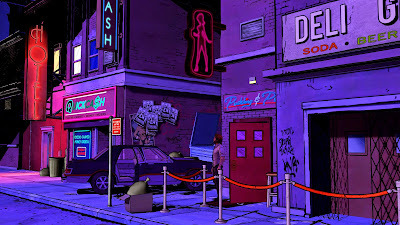 The Wolf Among Us is set during the 1980s in New York City. Fairy tale characters (aka "Fables") now live amongst normal humans (called "mundanes") in their own immigrant neighbourhood known as "Fabletown". Some fairy tale characters, who can afford it, use "glamour" in order to disguise their true appearance from mundanes. Those that cannot afford to disguise themselves are sent to "The Farm" in rural New York. You play Bigby Wolf aka The Big Bad Wolf, whose job is sheriff of Fabletown. Consequently it's your job to keep the peace and in the fifth episode, all things will be resolved and everyone will live "happily ever after" - or will they? Just as it was with the previous episodes, there appears to be a branching narrative in this game so conversations will be slightly different based on your relationships with other characters or certain clues you notice. At the end of an episode, you're also able to review whether you sit with the majority or not when it comes to pivotal choices in the game (e.g. showing compassion to a character or not). Another nice feature that has been added when you finish the game is a summary of which characters are still alive and which ones are deceased by the end, along with important decisions you made with respect to each of them. While this episode is extremely short just like Episode 4 before it, you're in for a real treat as this finale has a lot of action in the first half with my favourite part being Bigby's final showdown with Bloody Mary (not really a spoiler, everyone could see it coming :)). 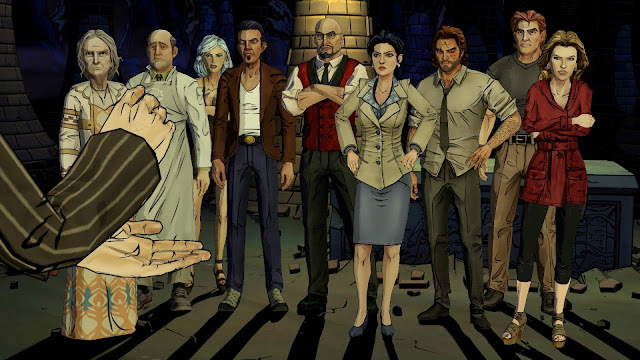 The second half, while not containing as much action is just as tense as Fabletown attempts to decide who the real bad guys are with Bigby often having to defend his actions. The difference between right and wrong is often questioned and you'll be justifying your existence in what I found to be a fantastic finale and my favourite episode out of the five. All loose strings aren't dealt with though by the end of the episode which hints towards a sequel. I certainly hope that's the case! Just like The Walking Dead, and indeed previous The Wolf Among Us episodes, gameplay may seem minimal by some since it basically consists of very simple puzzles ala the adventure game genre incorporated with visual novel elements (e.g. conversations having an impact on character relationships) thrown in with a bit of Quick Time Events (QTEs) for action sequences. For those valuing gameplay over plot, you have been warned! The game has some moody 80s-style synth which fits the game perfectly (this is a neo-noir game set in the 80s after all). Nothing too memorable but top quality stuff all the same. I think Jared Emerson-Johnson does some of his best work in this episode in terms of amplifying player emotions. The graphics are on par with The Walking Dead and since this game is also based on a comic book, it has incorporated a similar style. The only issues I had was the occasional framerate jumps and the occasional animation glitch. Just as it was in The Walking Dead, replaying The Wolf Among Us will reveal a slightly different narrative depending on the choices you make. Just as I did with the previous episodes, I tried to continue my stoic and professional approach, i.e. refraining from violence and trying to stick to the rules where I could (although I ended up bending the rules despite my best intentions). Unlike The Walking Dead, it's slightly more difficult to get all achievements, requiring you to explore different choices I believe in order to unlock all of them (which in turn invites at least one replay). Unfortunately, as it's a Telltale game, it uses the most recent Telltale Tool so the interface is a very console-friendly one, not a simple point 'n' click adventure. The game also has the annoying Type 1 save system where progress is autosaved but you never know when the next save point is. Cry Wolf is a fantastic send-off to Telltale's The Wolf Among Us and is probably my favourite episode in the series. You finally get to see Bigby in his element while also receiving the opportunity to engage in some interesting moral debates towards the end of the episode. I cannot wait for a second season of Fables :). If you want to get the game, you can get it on Steam or Telltale Games .